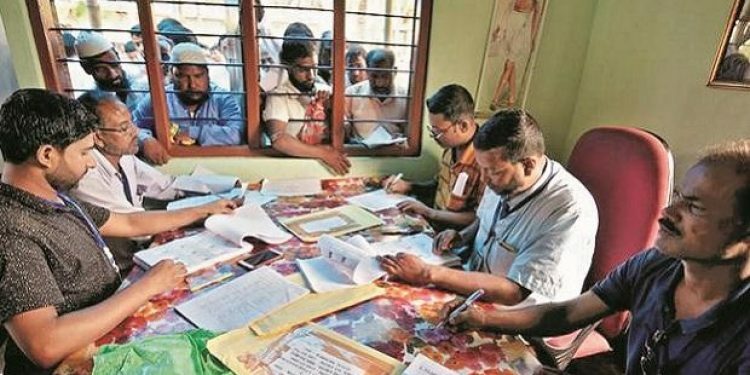 The hearing of 36 lakh applications of those people excluded from the National Register of Citizens (NRC) will begin from February 14 next. According to reports, the NRC authorities have employed as many 3500 officers to be on the job. The first 15 days will be document verification as the 36 lakh people have submitted fresh documents. Notably, the Supreme Court has directed the NRC authorities to publish the final document on July 31, 2019. The NRC Coordinator’s Office is planning to complete the process of hearing and verification of the claims and objections by June 15 as at least 45 days would be required for quality check so that the deadline of July 31 set up by the Supreme Court for publication of the final NRC can be met. The notices for the next phase would be sent out only after getting confirmation from the Government on the number of officers to be deployed for the job. It may be recalled that around 40 lakh names did not figure in the final draft NRC published on July 30 last year. Among them, some 36 lakh people have reapplied with fresh documents leaving just four lakh who did not come up for fresh application. Notably, the apex court has refused to extend the deadline for publication of the final NRC because of the ensuing Lok Sabha elections. The Court, in its last hearing on February 5, was critical of both the State as well as the Central Government for their inability to publish the final NRC on time.